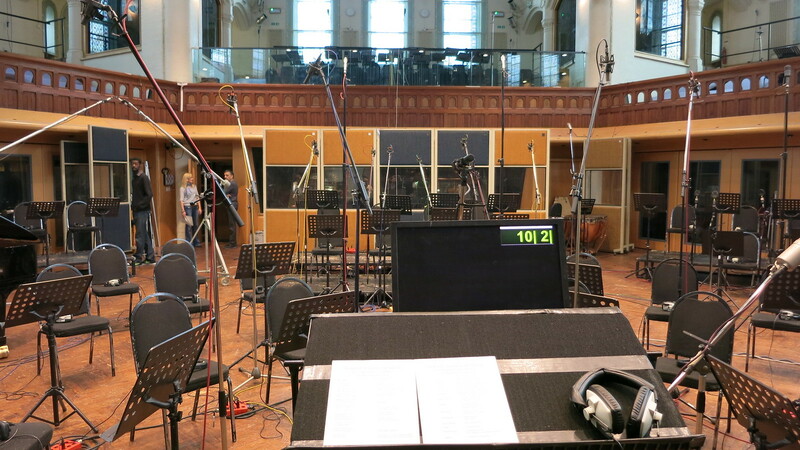 The view from the podium… at AIR Studios! 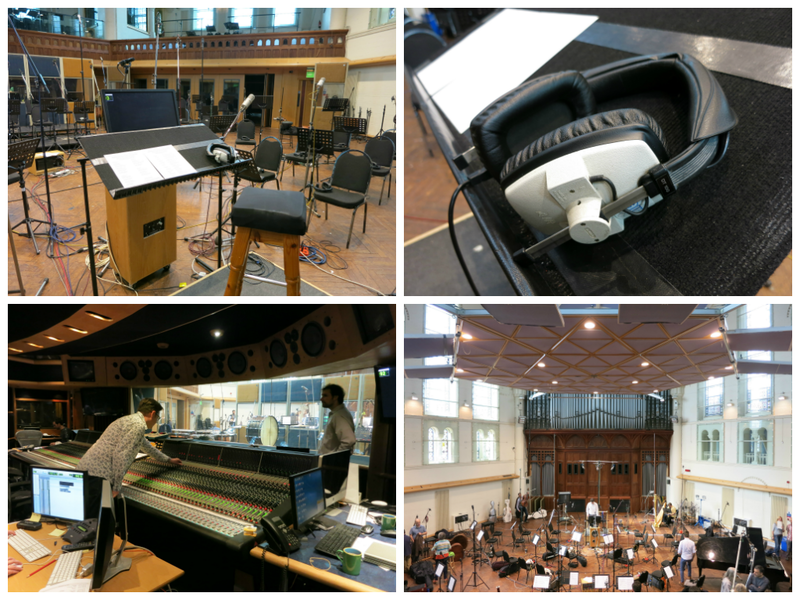 In addition to representing a very practical part of our Master’s thesis, the recording at AIR Studios was, according to Lucio, intended to be something of a gift from Berklee to us. As you may recall, I had been looking for a collaboration that would be suitable for this very special recording session. However, at the end of April, Lucio explained that we should feel beholden neither to rescoring an existing piece of film nor finding an original collaboration to fit our specific requirements (an orchestral cue with a duration totaling no more than 3 minutes) after all. Ultimately, he gave us the option of essentially having total freedom on this project, even going so far as to allow us to write our own script — the reverse of our very first scoring assignment (which I detailed way back in this post). I was granted permission to work with a montage of clips selected from the work of Hayao Miyazaki, setting the resulting sequence of flying scenes from several movies to original orchestral music. That the material is a tribute to Miyazaki ties it in with my written dissertation on the music of Princess Mononoke. Everybody wins. 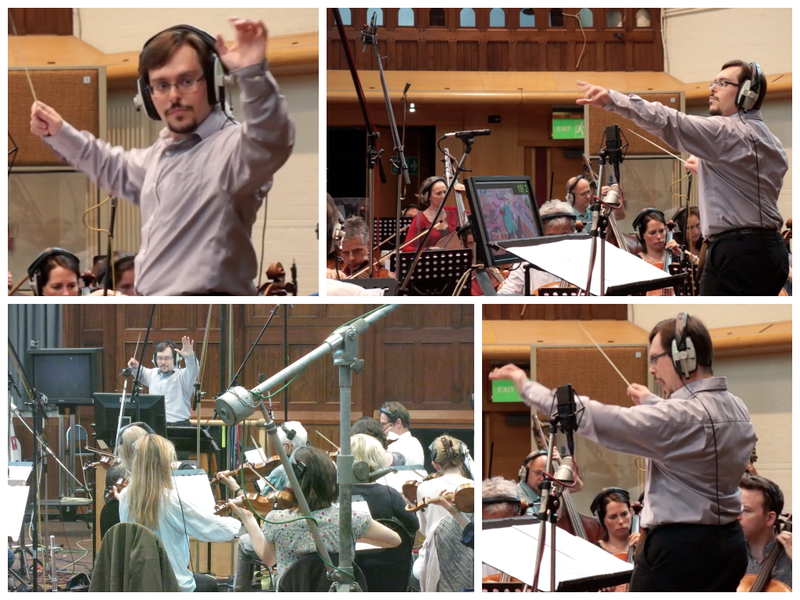 As with almost all of our orchestral projects to date, we were each responsible for our own composition, orchestration, notation and music preparation, Pro Tools session preparation, and conducting. Because this piece outweighed anything the we had done this year in terms of duration, instrumental density, and significance to our studies here at Berklee (to say nothing of the calibre of the musicians and recording studio before us), this project demanded more time, care, and attention to detail in every regard, from taking extra care in preparing a good-quality mockup (in case it was needed for demonstration or reference purposes) to translating my MIDI performances into a legible format. Fortunately for us, we were granted one full week of our intersession break to work solidly on our projects, allowing us the time for switching hats between composer, orchestrator, and copyist (and in so doing, seeing me carry on on such bizarre conversations with myself as, “Was this ‘1-2-off’ or ‘1-2-3-off’?”). “Looks like ‘1-2-3-off’ to me.” Photo: Alex Palmer. As I may have mentioned in the context of our first Budapest recording in December, if our professors’ call for perfection (emphasis theirs) was to be heeded at any time, it was now. The process of ensuring that everything was perfect (or as perfect as possible, barring minor adjustments) before leaving Valencia culminated in two consecutive all-night sessions of writing, orchestrating, and preparing my score and parts before boarding the flight to London. Even now, all this time later, I still have moments in which I catch myself wondering if I really was aware of what I was doing, what with being effectively on autopilot while vacillating between overwhelming excitement and sheer panic, but I have to trust that I knew what I was doing at the time. I would like to think that I have the perspective to realize that for as much pressure as there was in this situation, I can only imagine how things must be in the “real world” (but I also imagine that we might have more than 18 minutes to record a 2½-minute cue in the aforementioned “real world”). I also now have a deeper appreciation for why media composers may elect to assemble teams of assistants. After putting the finishing touches on my score and parts as the sun rose, I packed my bags and caught a cab to the airport, where I met my instructors and about a dozen of my excited classmates (some of whom were practically bouncing off the walls) who had opted to allow Berklee to handle the arrangements for travel and accommodations. We enjoyed a relatively uneventful flight to London, during which time we kept each other entertained by showing off our scores and mockups (and in some cases, making final edits). Yes, we were our own in-flight entertainment. I was fighting off intense waves of fatigue in the latter portion of our flight and was just about to enjoy a short nap when my seatmate asked me to give him a demonstration of Sibelius. As I am demonstrably capable of using Sibelius in my sleep (if this year has been any indication), I was happy to oblige, and it perked me up for our descent into London’s Stansted Airport. We claimed our baggage and boarded our waiting coach for the journey to our hotel in Hampstead, located northwest of downtown London and practically steps away from AIR Studios. As many of us still needed to print our scores and parts (myself included), we had scoured the Internet for a suitable print shop that kept appropriate operating hours in order for us to take care of our printing well in advance of our recording. After having lunch and resting up, a group of us ventured downtown to the King’s Cross-St Pancras area, flash drives in hand, to search for said printer. On our way to the Tube, we spotted a print shop close to our hotel that looked promising, but had already closed for the day. We resolved to consider it as a backup in case we could not have our print orders fulfilled that night. After our transit downtown, we arrived at what was supposedly the correct address, and were disappointed to discover that what we had perceived from their website as a FedEx Kinko’s-style print shop turned out to be an Internet cafe, with perhaps two staff members monitoring as many print/copy machines, and a day’s worth of work ahead of them at 9 o’clock at night. Good thing we found ourselves a backup location to visit the next day. The next day was, however, incredibly busy. This journey to London was not really designed as a pleasure cruise — in truth, it was a bit of a whirlwind — and those of us who let the school handle our travel arrangements were only in London for the duration of the planned events. 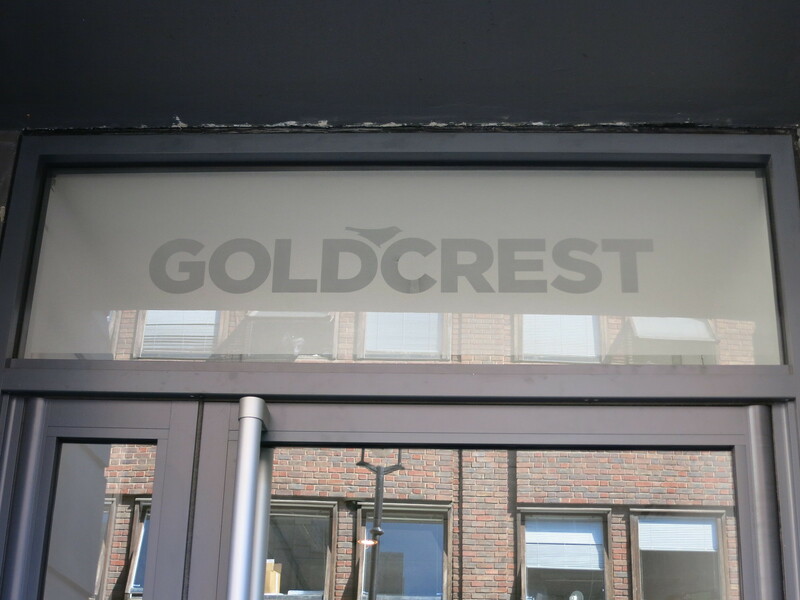 With an early start (that was surprisingly easier than early starts in Spain), we headed to our first workshop at Goldcrest Studios. The front door of Goldcrest Studios. Here, at Goldcrest Studios’ post-production facility, we had a seminar with sound designer and dubbing engineer Adrian Rhodes about what goes on during the dubbing phase of a film, in which the finished music tracks are mixed with dialogue and sound effects, and what we as film composers are usually expected to deliver in order to make the dubbing engineer’s life easier. 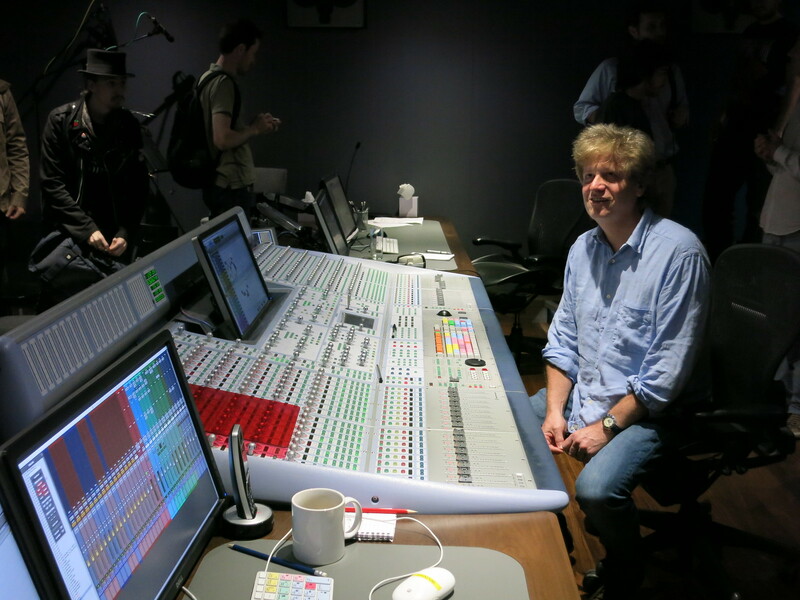 Engineer Adrian Rhodes at the Studio 4 dubbing stage console. 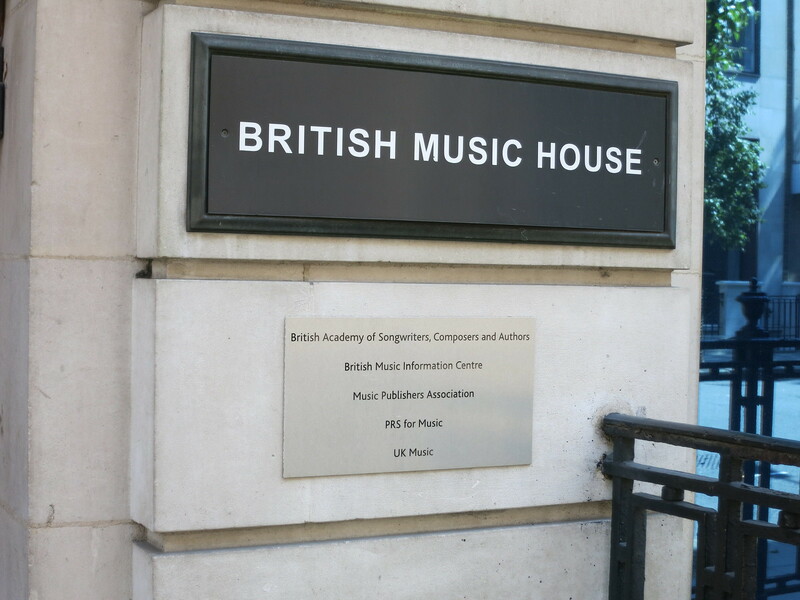 Later in the morning, we wended our way through the streets of London towards the British Music House, home of BASCA and PRS for Music. 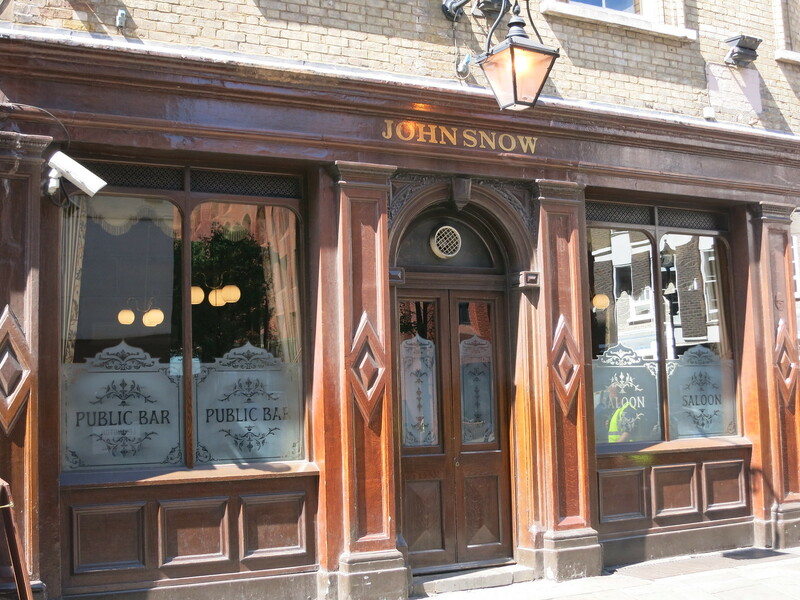 Seen en route: a place for people who know nothing. Our destination: a place for people who know a lot of things. We met with representatives from both PRS for Music and ASCAP, who explained the role and importance of performing rights organizations for artists and composers. In the afternoon, we set to take care of our printing. I returned to the print shop near my hotel and placed my order for my scores and parts. Halfway through my order, however, I noticed that something was amiss: certain symbols were misprinting as ☒, or were otherwise not printing at all. Minor panic. I was sure that my score and part files were perfect before my arrival in London (but since my score and parts were generated while sleep deprived, all bets were off). We checked the files, and, sure enough, they were as perfect as I remembered them being — at least, no missing or broken symbols. With the error not having been on my part (in spite of the lack of sleep, ha! ), we tried to run the print job from another computer, and it worked perfectly. Crisis averted. It’s a shame that we had to start the entire process again, but all we lost was time (and a few trees). 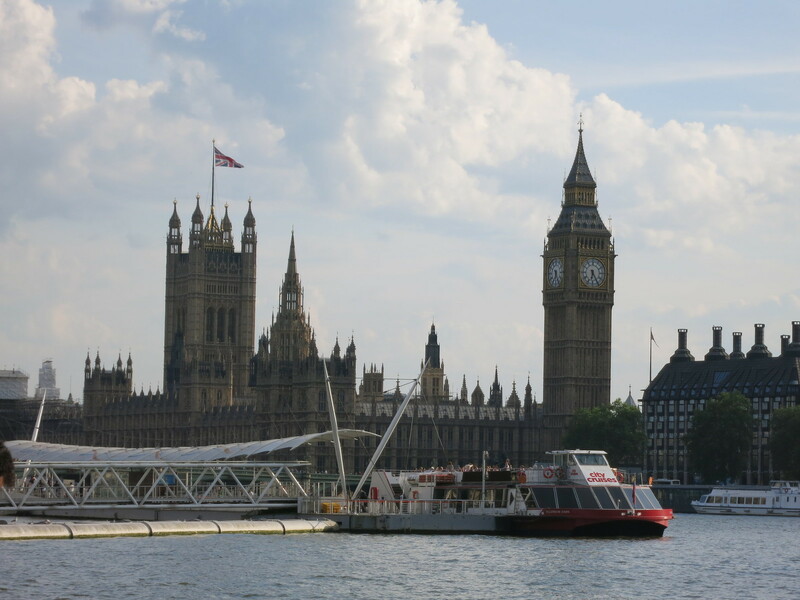 The Palace of Westminster, as seen from across the River Thames. After the day of workshops and printing, a group of us headed down to South Bank for an evening of relaxing and taking in a few of the sights. As we had not yet been given our recording schedule, many of us were unsure of just how free we would be the night before our first day in the studio, but I didn’t want to pass up the opportunity. With my scores and parts printed, all I had left to do was finish taping the parts and my personal copy of the score — oh, and practicing. As we sipped our drinks on a balcony high above the Thames, an e-mail came in from Lucio with our schedule for the recording sessions. Holding my breath, bracing for having been assigned the first slot of the next morning… I was anticlimactically scheduled for just past noon on Wednesday. It’s not that I couldn’t have stepped up to the challenge of recording the very next day — remember how I was among the first to record on the Ann Kreis Scoring Stage this year? — but I could at least relax and have a good night’s sleep without the pressure of a session ahead of me. Just take a moment and let that image sink in. Speaking of Hans, he just so happened to be recording there at the same time. In fact, our booking displaced him from Lyndhurst Hall (the main recording space) to a smaller room for two days. Over the course of our time at AIR, many of us seized the opportunity to speak with him or snap photos. Some were even bold enough to interrupt his lunch. I, however, was not so lucky; my chance to have face time with him was preempted by being ushered back into the control room before my recording on Wednesday. Phooey. Many of us took the opportunity to play tourist and take as many pictures and videos as possible. I certainly did my share of that as I walked around and admired the majesty of the room, but I also had a practical purpose in taking the time to get a feel for the room. Mentally comparing its dimensions to those of other stages, I wanted to get a sense of what the delay might be like between the podium and the players at the extremities of the hall (and back again, for the sound). With this rough analysis in mind, I knew how I would need to adjust my conducting technique to compensate accordingly for the latency. Tempting as it was, out of respect and reverence for both the space and my fellow composers, I decided to refrain from mounting the podium until the following day. The photos that I took could never do the space justice, but here are a few anyway. We were then invited to take our seats upstairs in the choir loft (where we saw the sheet music for a certain famous film composer’s latest score still on the music stands), and Lucio opened the proceedings by introducing us to the orchestra and explaining the scope of our Master’s thesis recording project. What followed was four recording sets, two in the morning, two in the afternoon, of some of the finest work my classmates had done all year. The room sounded amazing, the orchestra was top-notch, and the compositions themselves were brilliant — many of the pieces even sounded extremely convincing as film cues! More than that, however, after our year together, we could hear each other’s compositional voices shining through. Just about everyone looked like they knew what they were doing on the podium, as well — and considering that most of my classmates had no experience with conducting prior to coming to Berklee, that’s saying something. I guess this really is the last shot in the montage, in which everyone looks perfectly badass. 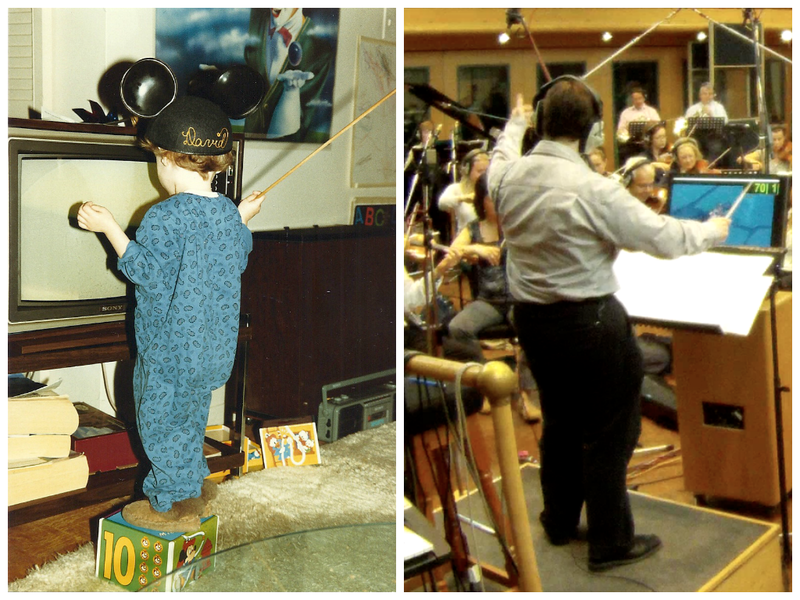 Words absolutely fail to describe the magic that we created in AIR Studios, but we all took an enormous sense of pride in one another. More than the dissertation that we still had to write, we considered that this was our Master’s thesis, and our 18 minutes on the podium was our defense. I spent the evening making final preparations to my score and parts and practicing my conducting against the click while managing my unwieldy, A3-sized score. For the first time all year, I got a decent amount of sleep before a recording session that I was conducting. Such an odd feeling. 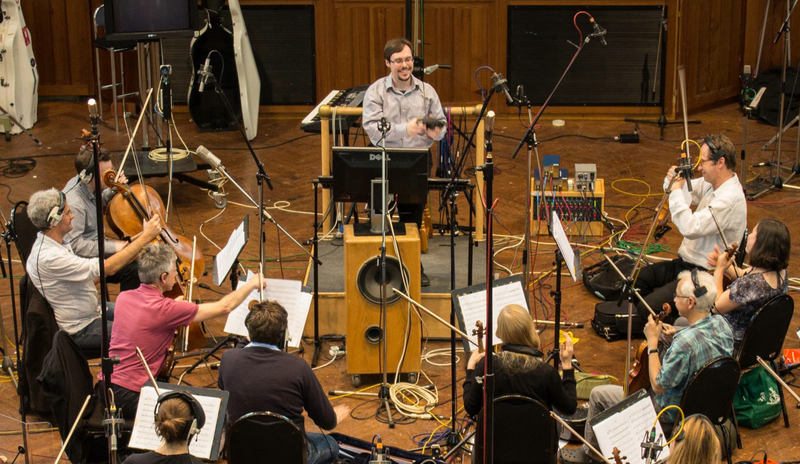 Years ago, when I was starting out as a young film composer, my creative partner at the time gleefully envisioned me one day getting to record my film scores on one of the leading scoring stages in London. 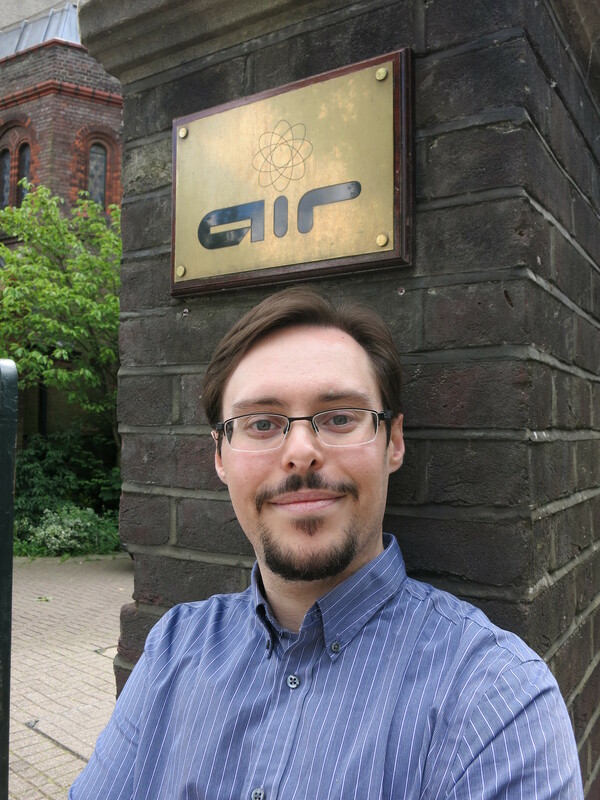 This trip to London, with the opportunity to record in Lyndhurst Hall at AIR Studios, represented much more for me than merely fulfilling part of my Master’s degree requirements. I’m very proud to say that this was nothing short of a long-standing wish come true. I was due up in the second half of the morning session, so I spent the first portion up in the gallery, listening to the work of my classmates, but as you might imagine, I was not — could not be — as present as I was the day before, in favour of mentally preparing for my upcoming performance. The orchestra sounded just as good as the previous day, which was encouraging. As the last piece of the first session finished, I sprang into action, joining my sessionmates in distributing our parts throughout the orchestra (yes, on top of everything else, I had to be my own librarian). This took up essentially the entire break. I was up second in my session, so I barely even had time to use the washroom. One of my classmates attempted to intercept me en route to the facilities (I really had to go! ), and then led me outside afterwards to show me the reason for accosting me — that is, who was out in the front lot: the big HZ himself. So, yes, I saw Hans Zimmer. Maybe next time, I’ll get to talk to him. 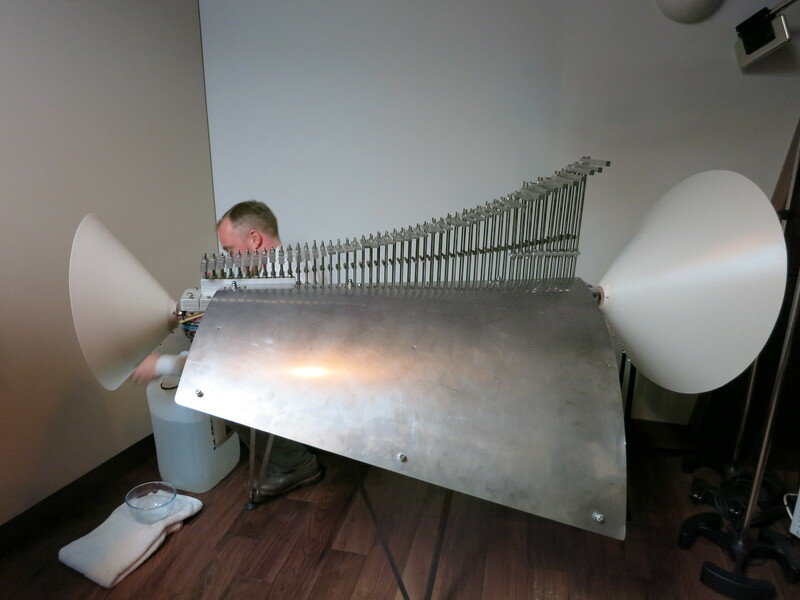 Ushered back inside the control room without being able to even introduce myself (thanks, guys…), I listened to the end of the recording before mine, took a deep breath, and strode out into the live room with my baton in my hand and the score under my arm. Exchanging a high-five with the previous student, I mounted the podium and placed the score on the stand. I greeted the orchestra and thanked them for their hard work so far, and again in advance for the hard work I knew that they would put in to my piece. 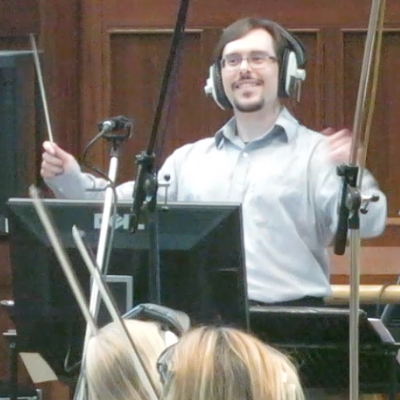 I even let the orchestra in on just what this recording session meant to me, and the concertmaster afforded me a quiet salute with his bow in acknowledgement. In the booth was the inestimable Jake Jackson as my session engineer (arguably one of the best in the business), assisted by the delightful Fiona Cruickshank. My team of producers was composed of Lucio Godoy, Alfons Conde, and Vanessa Garde. Needless to say, I was in good hands. 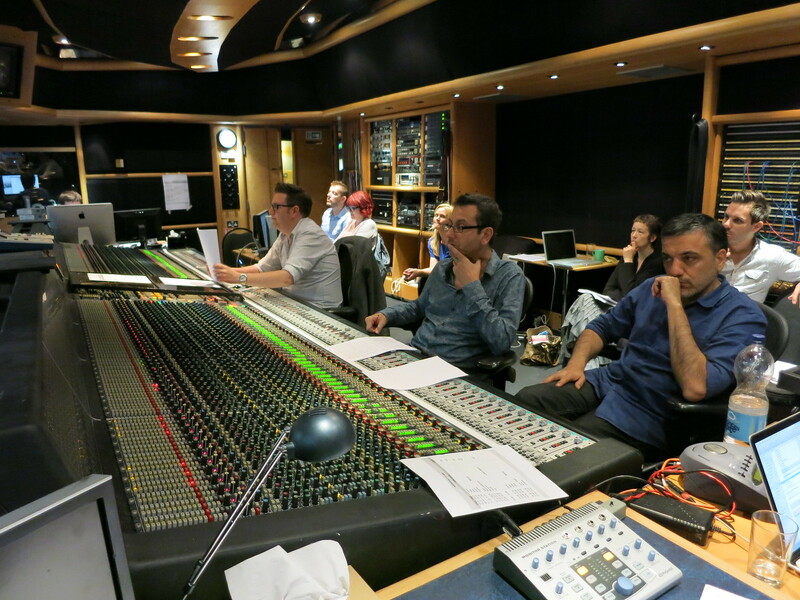 Mission Control: Jake Jackson (left) helms the session with Alfons (centre) and Lucio (right) looking rather pensive. In every aspect of this piece, from the composition process to the recording session, I wanted to recapture the spark that I first felt in September, back when I was on the podium for “The Note.” In every project that we had done in the second semester, I was either in the control room or working exclusively with MIDI. 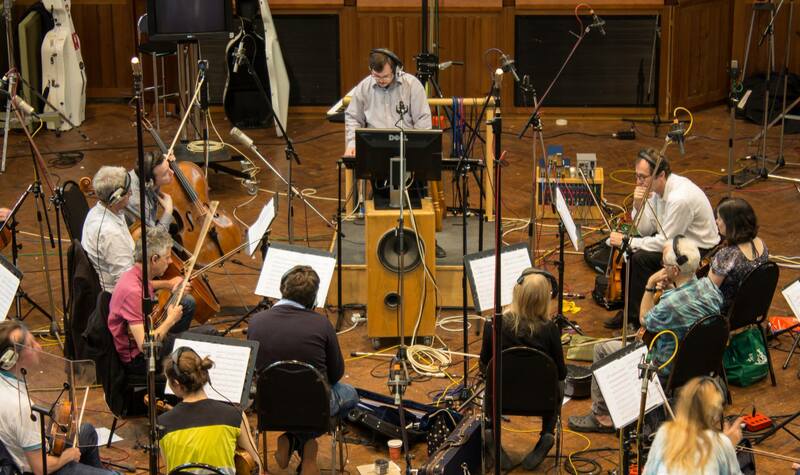 Even the recording with the string section of the Budapest Art Orchestra in March didn’t feel the same. For this project, I got to write something that I could be truly proud of, something that was truly my own, and in addition to functioning as accompaniment to the video, it could be one piece that would serve as a musical summary or bookmark for my Master’s experience here at Berklee. Plus, I now have something that I can use as my own theme song. Heh. With the slightest quiver in my baton hand, I counted off the lead-in beats, and with a swoop of my hands, my piece sprang to life. I was initially overwhelmed by the enormity of the reverberations in the room combined with what I was hearing through my headphones, but it surely takes more than that to throw me off. The first take made for a good rehearsal; most things were already in place, thanks to the superb reading skill of the musicians. As the final notes dissipated into the rafters, the production team and I took turns trading suggestions and recommendations for improvement. Another take was followed by more suggestions and a couple of questions from the orchestra. Finally, we reached the third take, which was almost a perfect run. I had decided in advance that by take three, I would step away from my score and conduct by heart. So, how was the session? A few stills from the recording videos. Clockwise, from upper left: cueing a harp entry, cueing the piano, emphatically cueing the orchestra (or casting a spell! ), and winding up for the big finish. Images courtesy of Jacob Boyd and Xueran Chen. It was better than a good meal. One thing that my colleagues noticed about the session was just how natural I looked on the podium — how at home I seemed, how I looked like I belonged. Classmates reported that they were overcome with goosebumps and tears of joy during my recording. The musicians as well seemed to enjoy playing the cue; one of them even called it “exhilarating.” Even Lucio remarked that he thought that I, myself, was flying on the podium, along with the characters in the video. I am unspeakably grateful to Berklee and all those who made this experience possible. Click here to view the full list of personnel on this recording. 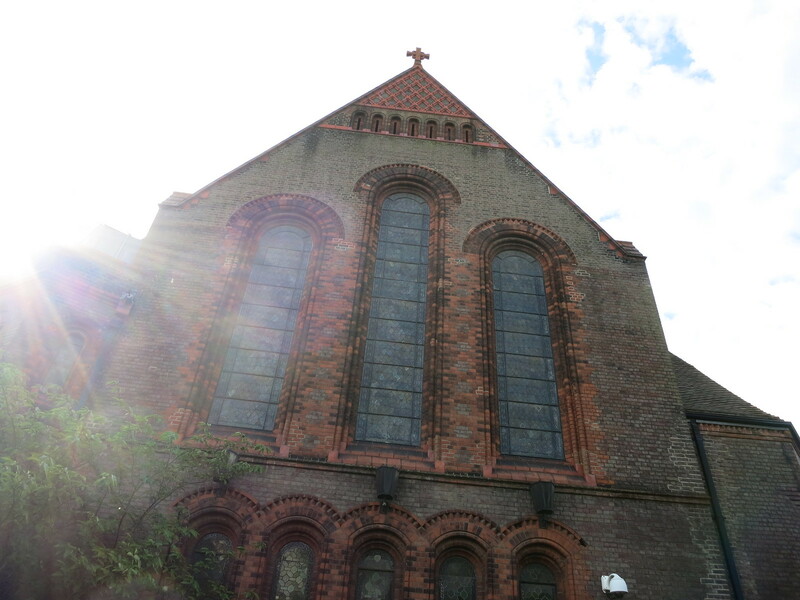 I loved being at AIR Studios — I didn’t want to leave! — so I lingered on site for as long as I could, until it was time for me to return to my hotel to change for our victory dinner, which was conveniently held just down the road from AIR. I happily joined my classmates and instructors, all of us swelling with pride, in an evening of celebration to mark the end of a successful two days of recordings. I went to bed incredibly satisfied, already looking forward to my next time on that podium. Mission complete. Photo: Alex Palmer. There was not too much rest for the wicked, though, as our final full day in London was marked with a packed program of workshops, seminars, and other events. With our heads still swimming from the excitement of the previous two days, we found Thursday, to be honest, something of a blur. 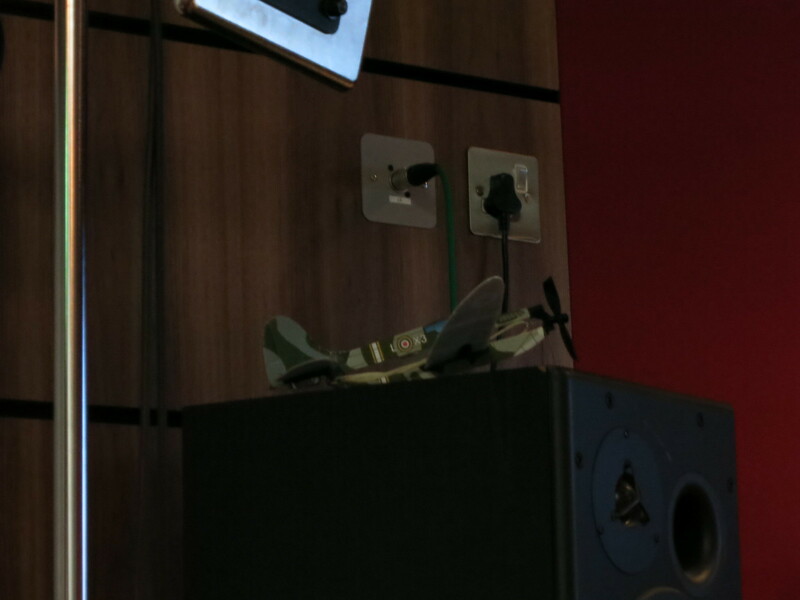 After a too-early wakeup, our first stop was Spitfire Audio, a well-respected sample library development company. We met with composer and developer Christian Henson, who enthusiastically indulged us with tales of his experiences, showed us his studio and some of his latest work, and gave us a special demonstration of his Euphone (which is now available as a sample library from Spitfire Audio). Does this look like Shrek to you? Next, we were whisked off to Air-Edel Studios, a company responsible primarily for music production and supervision for film, television, and video games, managed by Maggie Rodford, who visited us in Valencia in the first semester. After having lunch in their live recording room (gasp! 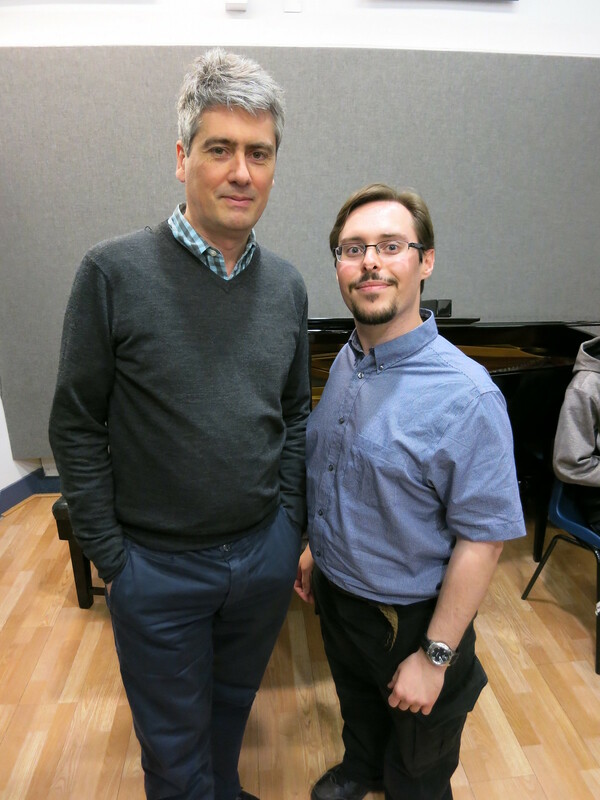 ), we had the pleasure of meeting Academy Award-winning composer Dario Marianelli (Atonement, Anna Karenina), who shared his advice and his stories with us (including about his interest in biology). Above all, he told us, “If you do your work conscientiously and put yourself into everything you do, it’ll be okay.” Getting to meet him was of particular interest for me because one of the scenes that I rescored in the Berklee Online film music composition course that I took last year was from his Atonement. Meeting Academy Award-winning composer Dario Marianelli. After lunch, the staff at Air-Edel conducted a series of workshops for us, which included sessions on music editing and temp scores, mixing in surround sound, and contracts and entertainment law. In the evening, we were invited to a special Berklee event at a pub downtown, at which staff and students mingled with alumni who are based in the London area. As usual, the Valencian contingent vastly outnumbered everybody else (to the point where it seemed like it was mostly a pub night just for us). As the party wound down (complete with it taking us an inordinate amount of time to get from the door to actually on our way, as was our custom), I parted company from my Berklee Valencia classmates to join someone I knew from one of my Berklee Online courses for dinner, diverging from the group to ride the Tube northwest to Edgware. It was lovely to meet her in person, and it is a testament to the global community that Berklee is fostering through its various educational platforms and outlets. There’s always time to make one more memory. You know what they say about all good things. Coupled with the fact that the start of our third semester was on the other side of the weekend, there was a palpable bittersweet twinge to our departure. In the little time between checkout and the scheduled departure of our airport coach to Gatwick, the group of us who stayed at the hotel in Hampstead decided to nip off to AIR to take a few last photos; I knew that I would regret it if we did not take this one last opportunity. We were greeted by the open arms (and massive beard) of Glen, their security/concierge who was among the team of staff who took such good care of us during our recording days. We were happily welcomed back to AIR, and he gladly obliged us in taking a few photos. We bid a final farewell to Glen, his beard, and AIR Studios, and boarded our coach for a too-long (read: 2½ hours) ride to Gatwick as rainclouds rolled in overhead. 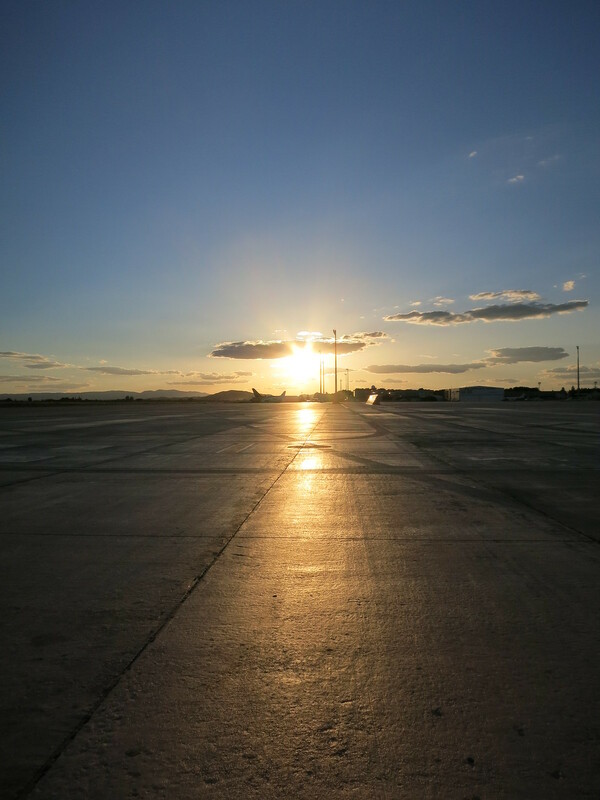 Our departure from London felt as somber as the skies above, and strangely, our return to Valencia felt somehow like a warm homecoming to me. Really, who could argue with being greeted like this? After our return to Valencia, we set to work editing, mixing, and mastering our recordings. For my part, I must say that even on the raw recording, the room sounded breathtakingly beautiful, and relatively little acoustic makeup was required in post-production. Now we know one reason why so many top-level productions choose AIR as a recording venue. So ended our trip to London, our second semester, and a major portion of our Culminating Experience project. With barely a break, we prepared ourselves for our third and final semester of the Master’s program, a seven-week sprint to the finish. In this time, many of us took one final elective while working on our London mixes, our dissertations, and any other projects that necessitated (or encouraged) the use of Berklee’s facilities one last time before graduating. This trip to London was a transformative experience for me. I had accomplished one last successful recording session of my Berklee Valencia career, I had fulfilled a lifelong dream, and, interestingly enough, it removed all doubt from my mind as to the quality of the material that I had produced in the second semester. Through the winter and into the spring, I had expected to feel better about the work that I was producing. Indeed, given my particular feelings about the quality of my second-semester output on the eve of my London trip, one might assume that the recording at AIR would surely eclipse everything written prior, to the extent that I would want to bury those pieces and never allow them to be released. To my own surprise, however, I found that my success in London made the work that I had done in the preceding few months appreciate in value (to me, at least). It was not until after I returned from London in triumph that I was able to experience my compositions anew, this time listening from a position and perspective of strength, accomplishment, and enjoyment. Most of all, it gave me the hope that maybe, just maybe, I could have a shot at doing this media composition thing professionally.